The modern headphone renaissance has produced headphones under $100 that now offer better sound, looks, and durability than ever before. With so many great options, it can be tough to know which are the best for your needs. To ease your burden, we put together this value-packed list of headphones for $100 or less. So close those Amazon review tabs and settle in because there’s something here for everyone. And if you need even more options, don’t forget to check our comprehensive guides to the best fully wireless earbuds, noise-canceling headphones, and earbuds. Why you should buy them: They offer a perfect blend of comfort, sound, and portable convenience. The V-Moda Forza offer excellent sound quality, go-anywhere design, and plush comfort. Who they’re for: The active everyday listener who wants great fidelity in a small, portable package. Our former sub-$100 champ, the astoundingly good Sennheiser Momentum, has recently been priced out of the running, but that means another model can now be declared king of the affordable market. Enter V-Moda, whose excellent Forza in-ears offer the perfect blend of fidelity, comfort, and sport-ready performance for any audio adventure. The water-resistant earbuds are a no-frills product that put excellent sound quality at the forefront with a round and warm sound signature that pairs well with virtually all genres. A wide assortment of sport fins and tips means that almost any listener will find a perfect seal, and they’re made from a soft rubber compound that ranks them among the most comfortable in-ears we’ve ever encountered. Because the earbuds are designed to resist the elements, they are a perfect companion for workouts, rainy commutes, or any other outdoor activities where they help bring another level of fun to the adventure. If you’re looking for a pair of headphones that will go with you everywhere and never disappoint, we can’t think of another pair we like as much for the money. Why you should buy them: These headphones offer a great mix of classic style and balanced sound. If you’re looking for a set of rock-‘n’-roll-styled on-ears that also sound great, the Marshall Major II are a perfect option. Who they’re for: The stylish listener who doesn’t want to sacrifice fidelity for looks. Marshall Headphones has a knack for mixing excellent style and solid performance, all in a package that is easy on the wallet. Designed with a malleable headband and foldable earcups for maximum portability, the durable Major II is a perfect case in point. The revoiced 40mm drivers deliver solid performance across the entire sound spectrum, with impressive midrange and low-end sounds, as well as a satisfying instrumental separation. The gold embellishments and ’70s-era-type coiled cable add some vintage flair to an otherwise modern pair of headphones. Those looking for a wireless model who are willing to spend a little more will be happy to hear there is a Marshall Major II Bluetooth model available as well. Why you should buy them: The Shure SE112 Wireless are comfortable, sound great for the money, and work with your jackless phone. Who they’re for: Price-conscious new phone owners who need great sound on the go — and don’t want to tote along an adapter. Like their wired counterpart, the Shure SE112 Wireless sound twice as expensive as they actually are, thanks to their special dynamic drivers and the passive noise isolation afforded by their robust silicone eartips. A strip of soft rubber accompanies a thick layer of plastic on each earpiece, and though they are intended to be worn inverted, they still manage to drown out the noise of the outside world regardless of which configuration you choose. It was only a matter of time before Shure took these earbuds wireless, but if you’re still holding onto your old phone, you can procure their wired counterpart for half the cash — a scream of a deal. The hallmark is their incredible sound, which exudes a commendable level of detail within a lucid, expansive soundstage that excels across the frequency spectrum. The rock-bottom price and solid construction render them among the best value propositions on our list, in wired or wireless form. Why you should buy them: The Klipsch R6 are a stylish, excellent sounding pair of earbuds for a serious bargain. The Klipsch R6 offer stylish design and incredible sound for a price that barely registers. Who it’s for: Serious bargain shoppers looking for a steal of a deal. Available in multiple model options, including optimizations for iPhone with adapter (R6i) or Android (R6), these Klipsch specials are oldies but goodies that have come screaming back to our list for one simple reason: They now offer tremendous value. Once a $100 pair of buds, the R6 were usurped by hungry newcomers like 1More’s Triple Drivers and our top pick on this list, the V-Moda Forza. But make no mistake, even at their original price, the Klipsch were a great pair of earbuds. The R6 have a bit more bite than some of our favorite earbuds when it comes to the upper midrange, but if you don’t mind their more excitable sound, you’ll be rewarded with crystal-clear treble and revelatory moments of detail that you just don’t often find at this price, or even above it. If your wallet is bare, but you gotta have great sound, these are a prime choice. Why you should buy them: They offer the best sound quality you’ll find at their price point. Who they’re for: The audiophile who doesn’t have deep pockets. You won’t venture far on your headphone research journey without hearing about Grado cans. This Brooklyn-based family company is renowned for retro styling, quality construction, and excellent performance-to-dollar value. The SR80e offer a prime piece of Grado’s coveted experience for the dough, but Grado’s open-back design is a double-edged sword: The style offers an airy, vividly clear sound signature, but the world will hear your tunes and you will hear the world. That means they are not great for the bus, or public moments of reverie with your Phil Collins Greatest Hits collection. Still, you get great sound for the cash. This perennial hit will stay on our list until Grado stops churning them out, or replaces them with something better. Why you should buy them: They offer great durability, excellent sound, and simple looks. Rugged design and excellent fidelity have made the Sennheiser HD 280 into a studio mainstay — and a serious value for your money. Who they’re for: The podcaster or musician who needs a pair of workhorse headphones. There are plenty of options from Sennheiser under 100 clams, but the HD 280 offer rugged construction, a coiled cable, and crystal-clear sound that digs up subtle moments from deeper layers of the music. These are the rugged mainstays that you’ll see in the background of many radio stations, recording studios, and video-editing rooms for a reason: They sound great, take a beating, and their simple black aesthetic keeps them from nabbing too much attention. They may not wow with style, but if you’re looking for some affordable over-ears that will last you many years of solid use, in or out of the studio, we suggest you start here. Why you should buy them: They offer outrageously good performance in a small and stylish package. 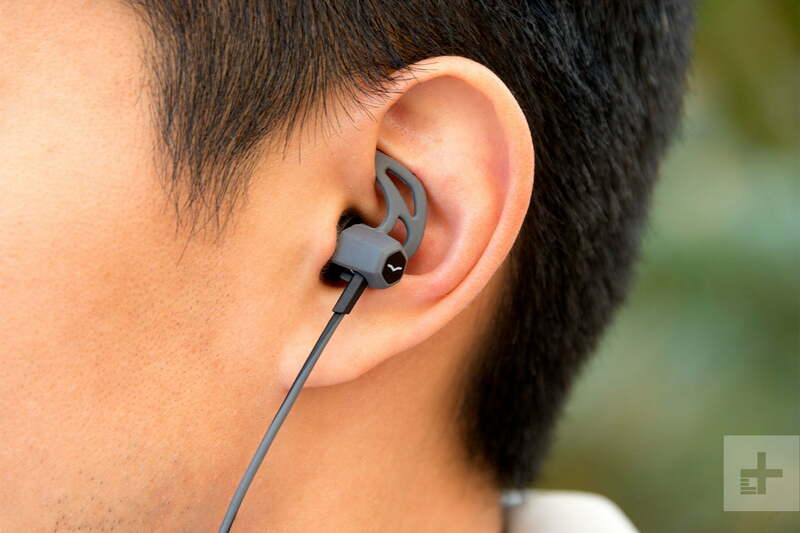 The three separate audio drivers inside each earbud translate to the clearest possible sound for your money. Who they’re for: The serious listener who wants incredible sound in a hyper-portable package. Chinese company 1More‘s Triple Driver earbuds manage to deliver all the features of a high-end set of in-ear headphones at an affordable price, and in a package that looks and feels premium. The Triple Drivers deliver clear, quality upper frequencies, with 1More claiming a 40kHz maximum range on these puppies, as well as balanced-yet-weighty bass. For such a high-quality listening experience, it’s almost a shock that these earbuds start as low as $80. For those with a shiny new iPhone, there’s even a Lightning version available for a few more Hamiltons, along with a wireless version on the way. There really are very few ways to get better sound at this price point anywhere on the market, period. Why you should buy them: They sport punchy, bass-forward sound, durability, and comfort. The Audio Technica ATH-M40X are a low-end lovers’ dream, bringing an awesome amount of oomph to your favorite hip-hop and dance tracks. Who they’re for: The aspiring hip-hop or electronic music producer. These affordable cans from sonic stalwart Audio Technica are an upgrade from the ATH-M30X model, and serve as the younger sibling to the pricier ATH-M50X. The ATH-M40X offer a robust over-ear design and throw down a smooth, natural sound. The fluid upper register is paired with ample bass response down below, and the cans take on detail with an impressively sensitive touch for the price. These are a more low-end-laden companion to the Sennheiser HD-280 model, a studio mainstay that should appeal to hip-hop fans and electronic music listeners alike. Why you should buy them: You need some quality earbuds to wear while breaking a sweat. Who they’re for: Those with active lifestyles who still want great sound. As more cell phone manufacturers forgo the headphone jack, fitness enthusiasts are increasingly in need of an affordable workout option. Optoma NuForce’s BE Sport3 are the perfect solution for the money. A simple, sweat-resistant pair of buds that offer up to 10 hours of battery life, the wireless in-ears ditch the built-in fitness trackers we’ve seen on other sport-focused headphones, and prioritize ease of use and overall audio quality. In that regard, the tiny banded earbuds absolutely succeed, offering a sweet, balanced sound signature to help carry you through even the most strenuous of workouts. An elegant and lightweight design makes the BE Sport 3 practically disappear on your head during long listening sessions, which helps keep your focus on the task at hand. Why you should buy them: You need a set of budget cans and you’re (thankfully) not at the airport. Shure’s affordable on-ears look and sound great, bringing punchy low end and clean highs to your favorite tunes, and blocking out the world. Who they’re for: Those looking for the best price-to-performance ratio. Shure knows how to craft a premium pair of headphones, but thankfully the company’s foray into the world of budget-based models is equally impressive. Shure’s SRH145 are as powerful as they are light, basking in a futuristic, Beats-esque design that folds down for increased portability. They offer a surprising amount of passive noise isolation as well, which only complements their comfort and ability to reproduce rich sound across the spectrum. The upper register is smooth and balanced and the bass is accurate and punchy, allowing for a welcome ride whether you’re listening to Paul Simon or Kendrick Lamar. We test headphones and earbuds the way normal people live. We run every pair of headphones through a rigorous process over the course of several days. That includes playing them in all sorts of scenarios — be it on a bus, in the listening room, or at the office — and playing back from a wide array of sources. We know most people use their headphones with a smartphone, often with lower-quality MP3 resolution tracks, so we do too. However, we also move up to high-resolution audio files, as well as a wide variety of sources, including plugging in directly to a PC or Mac, using USB DACs (digital-to-analog converters), and employing high-quality dedicated portable players and amplifiers. Finally, we compare the headphones to some of our go-to models, both in their class and price point, as well as a level or two higher to find out if they can punch above their weight.